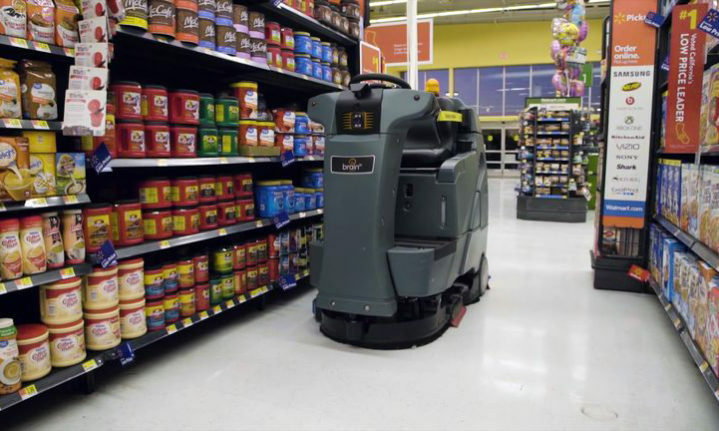 Walmart has signed a deal for aisle-cleaning robots. The retail giant has agreed to purchase 360 floor-scrubbing machines, built by the San Diego-based Brain Corp.
From a press statement, it appears that the company has bought over 300 ICE RS26s, a model which Brain Corp. says “represents the next generation of robotic floor care.” It’s got a cleaning path capable of scrubbing 26 inches at a time and moves at a leisurely 2 mph while functioning autonomously. Put it under manual control and it can hit 4 mph. According to Walmart, the robots are named Auto-C. The Bentonville, Arkansas-based retailer is the United States’ single-largest employer. The company employees over 1.5 million workers within its US operations. A study from Forrester Research in 2017 predicted that while automation has the potential to add 14.9 million jobs by 2027, it also has the potential to eliminate 24.7 million other jobs. Automation has become an increasingly large factor in the American workplace over the last decade. Companies from Sierra Nevada to Ford have began ushering forth automation in their factories. Amazon has been testing object-grabbing robots in competitions for years.